Welcome parents, one and all. Stay and play week has been a great success for many reasons. The weather has been (mostly) good and the play has been wonderful. Parents were roped into the shifting of pallets, logs and planks to make different creations, which their own children and others enjoyed constructing with them and then making use of. Some parents were busy cooking with their children and really made a complete mess of the kitchen, leaving pots, pans and soil all over the place! All of these experiences showed the parents how competent and capable their children are in the forest, and whether new to the nursery or well established, the children demonstrated their skills and abilities marvellously. Building has, again, been a major draw for the Little Forest Folk this week and we’ve had some interesting new additions to the forest’s equipment. 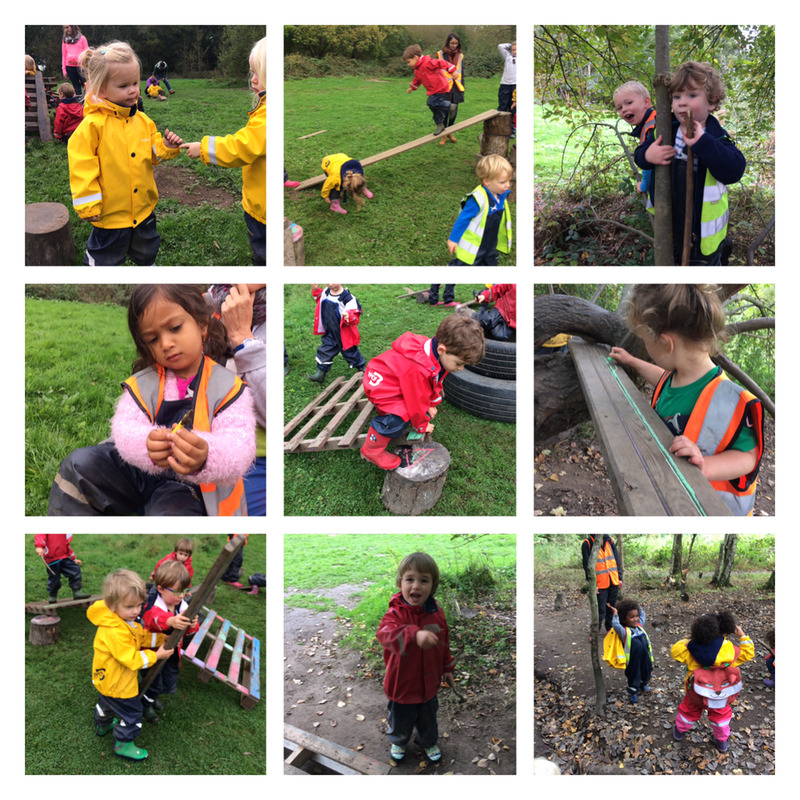 Firstly, with the help of a parent, a house was constructed in the middle of the meadow using all of the available resources, even things that the grown ups hadn’t seen! This became the basis for some wonderful role-play and lasted a fair few days. A group of children also put together some logs (stacked) with a long plank running from it, which became an excellent slide. The children slid down it in every way you could imagine, even running down it when sliding wasn’t enough! Chalks are very versatile drawing resources and the children have put them to good use all of the forest this week. Using all of the different colours available, a great group of children set about livening up the pallets that we keep for building. Some coloured, others drew, and more began writing and starting to form letters and words. The chalks were then brought to bear on several other bits of building equipment: white wall tyres are a thing of the past when you can have green wall tyres, created by our little forest folk; pirate planks became prettier with some new, colourful streaks; and some of the tree stumps became number and letter blocks for anyone to use. Newer PostWandsworth - Hide and Seek!